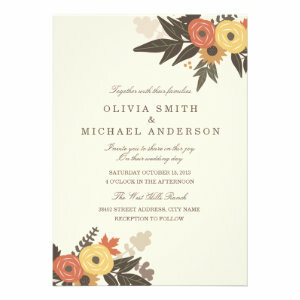 If you are getting married in Autumn these Fall wedding invites should suit the occasion perfectly! Your can easily add your own text to any of those designs by pressing "customize it" button on the product page. 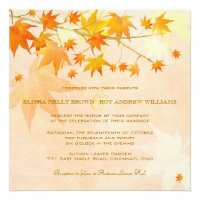 If you are planning an Autumn Fall wedding then these customizable invitations are a great choice. 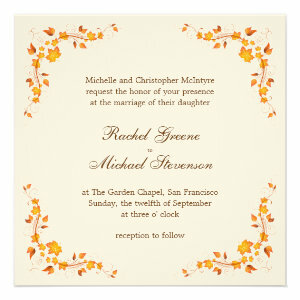 Easily personalized to include your guests names, party details and any other information relevant to your special day. You can change the font, colour, style and design, great for if you have a theme or idea already in mind. With designs featuring highly decorative leaves, wind swept trees, and plenty of floral inspiration. 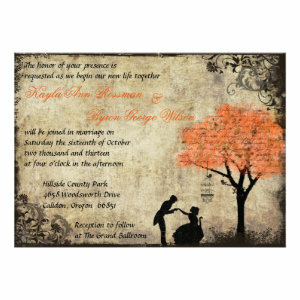 Our wedding invitations are suitable for any kind of Autumn wedding from daytime to afternoon or evening, and for many wedding themes. 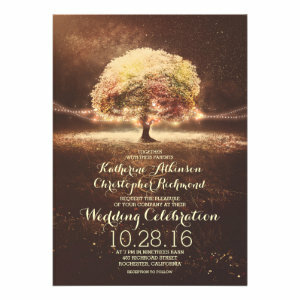 Find announcements for traditional weddings, rustic or vintage style weddings, ones for modern garden party weddings, or even woodland themed wedding invites. 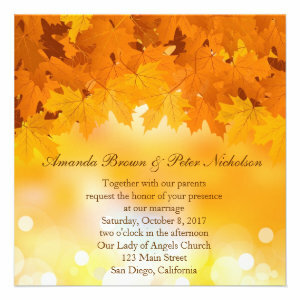 With different styles and designs to choose from we hope our Autumn Fall Wedding Invitations will be perfect for your special day.